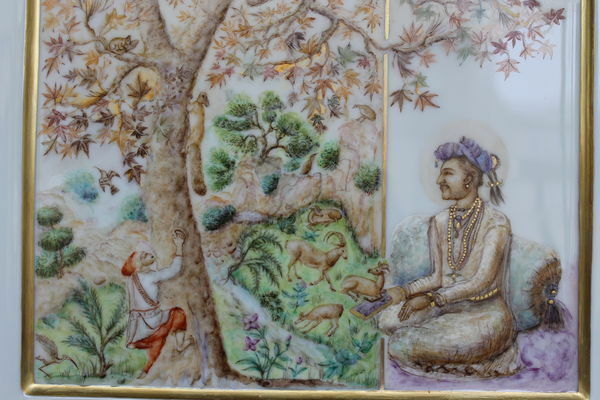 SQUIRRELS ON A PLANE-TREE (mughal painting) 26,50 cm X 26,50 cm : It is an unique piece signed and delivered with a certificate of authenticity in a gift box. This piece is decorated according to an old traditional technique. The colours, made up of dyes (metallic oxides), of turpentine oil and greasy spirit are applied by steel nib and paint brush on the enamelled porcelain. At the end, the gildind or the application of pure gold with a brush and burnishing to shine. Once decorated, the piece is placed in the furnace and cooked at temperatures varying according to the nature of the oxides.